Yeehaw! Spin the wild reels! Got your six-shooter and Bronco ready? 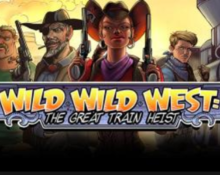 Join the four villains in “The Great Train Heist™” to secure your share of the loot. 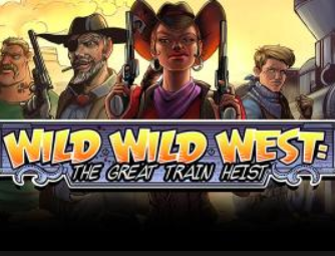 This comic-style game is an action packed 5-reel, 3-row slot with 10 fixed pay lines, set in the “good ol’ Wild Wild West” and boasts a whole array of Wild features in Free Spins and extra bonus rounds with potential for Mega and Super Mega Wins. All accompanied by some cheery Western music that animates players to tap their toes and join in the fun or rather heist in this case. 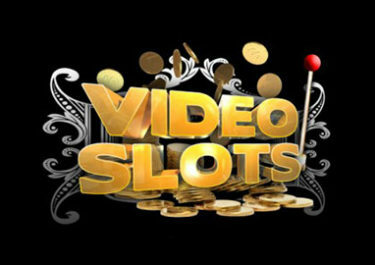 The new slot from Netent has just been released which means nothing else than plenty of Free Spins, without or on deposit. Making a post about each would see me still typing next week, hence, below is a list of casinos that offer Free Spins for Wild Wild West. Browse through the list and enjoy some spinning on the house. 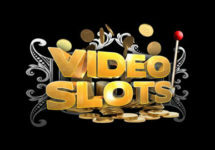 The games is a 5-reel, 3-row, 10-fixed line video slot with Free Spins, four Wild features and a Bonus round. Best sizes are from €/$/£ 0.10 – 100 with the highest 5OAK paying 50x and the lowest 8x stake. RTP is stated with 96.74% for this medium variance slot in HTML5 format that will be available for play on Desktop, Mobile and Tablet.